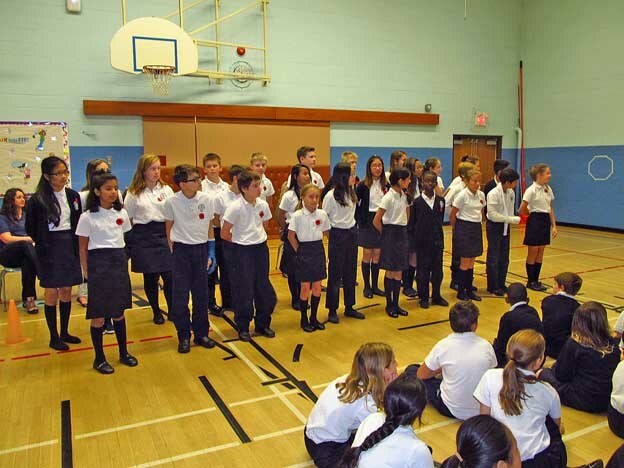 IHMS conducts a special Remembrance Day prayer service every year to commemorate all the Canadian soldiers who fought and died in previous and current wars. 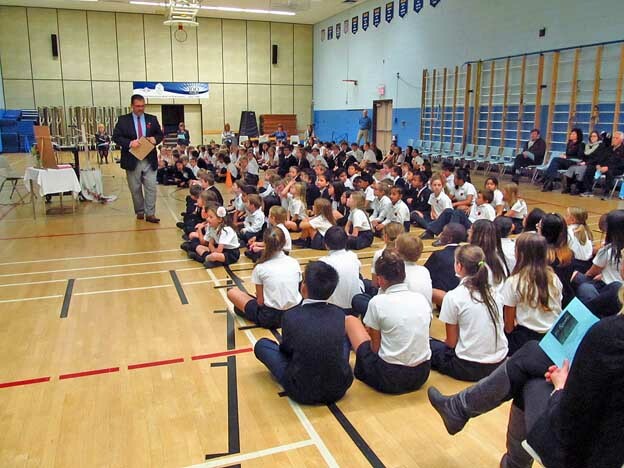 This year, staff and students gathered for the service in the school gym at 10:00 a.m. on Tuesday, November 10th. 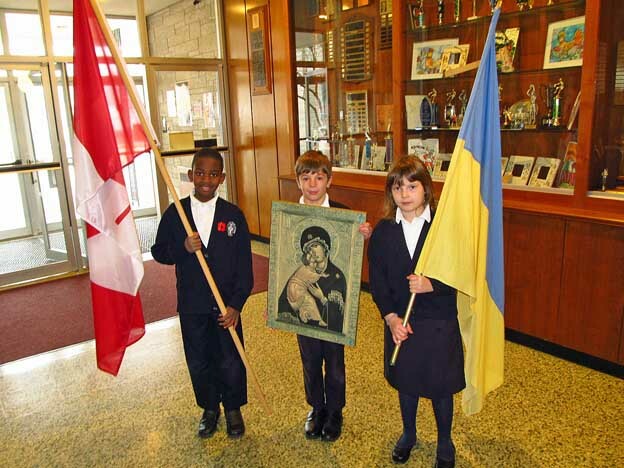 After a brief welcome by Mr. Picklyk, the service began with an entrance procession of three grade 4 students – Darius M., Josie K., and Connor R.. who carried the Canadian flag, the Ukrainian flag, and an icon of Mary respectively. 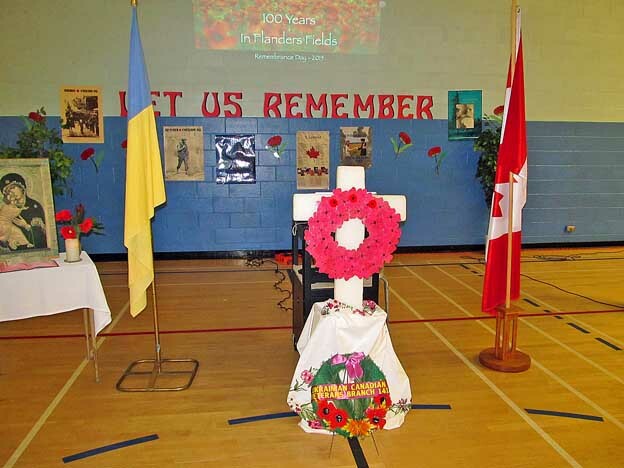 Grade 4 students Darius M., Connor R., and Josie K. brought the Canadian flag, an icon of Mary, and the Ukrainian flag into the gym at the beginning of the Remembrance Day Service. 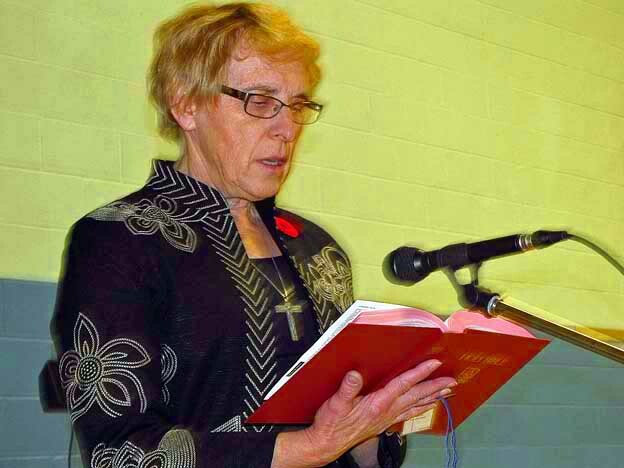 Everyone rose for “O Canada”, the national anthem, followed by a reading of the biblical passage Ephesians 4: 25-27, 29-32 by Sister Anne Pidskalny, SSMI. 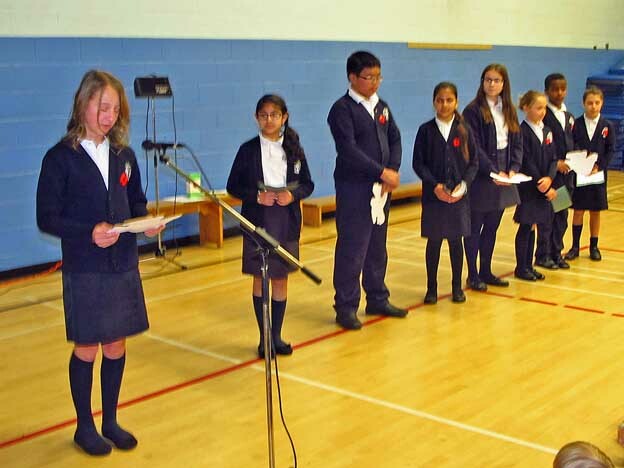 Next, a group of students from grade 4 (Khushleen D., Eknoor D., Rosita K., Jaclyn S.) and grade 7 (Ashlynn A., Myles C., Nadia M., Biniam T.) read a short passage on “What is Peace…”. 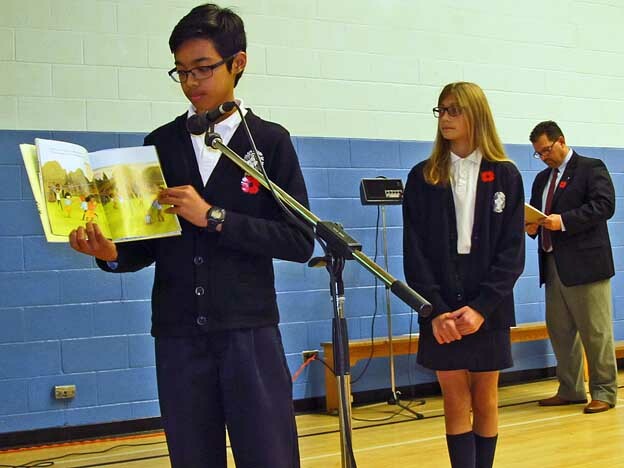 This was followed by a narration of the short picture book “Peace is an Offering” by two grade 8 students – Adrianna S. and Thomas T.
Mrs. Stanowych then led the grade 6 class (who were all holding lit candles) in a choral song entitled “Just One Candle”. 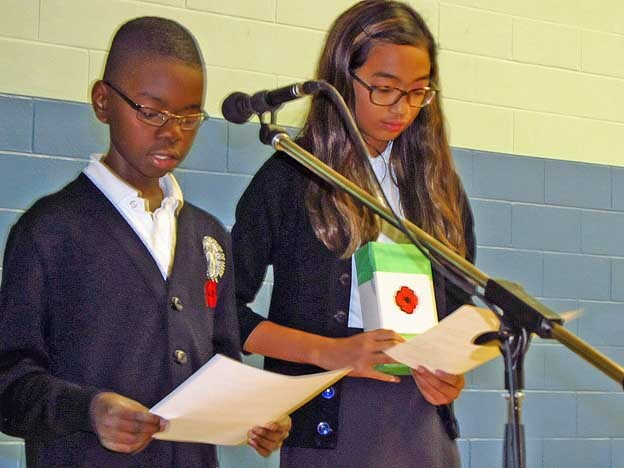 Next, two grade 6 students, Lauren A. and Donovan M. took turns reading an informative article entitled “All About the Poppy”. They explained to everyone why we wear poppies during Remembrance Day services and how poppy donations are used in Canada. 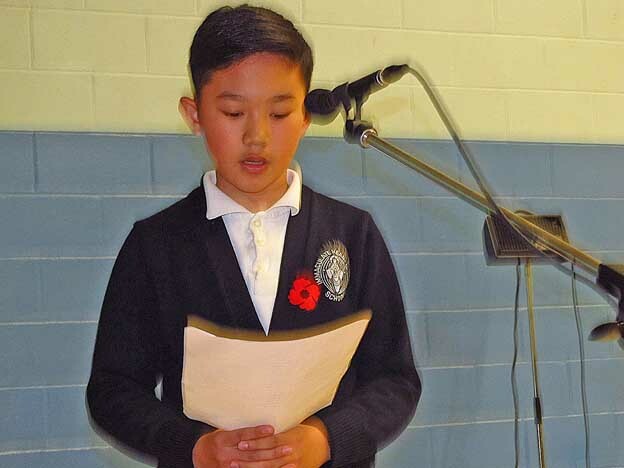 This was followed by a reading of the John McCrae poem “In Flanders Fields” by grade 8 student Eldrec A. This year (2015) marks the 100th anniversary of the creation of this famous poem. The poppy has come to symbolize Remembrance Day as a result of a poem written during World War I by a Canadian military physician called John McCrae. The poem, called “In Flanders Fields”, referred to the poppy because it bloomed in some of the worst battlefields of Flanders, and its red colour was an appropriate symbol for the horrendous bloodshed of the region. 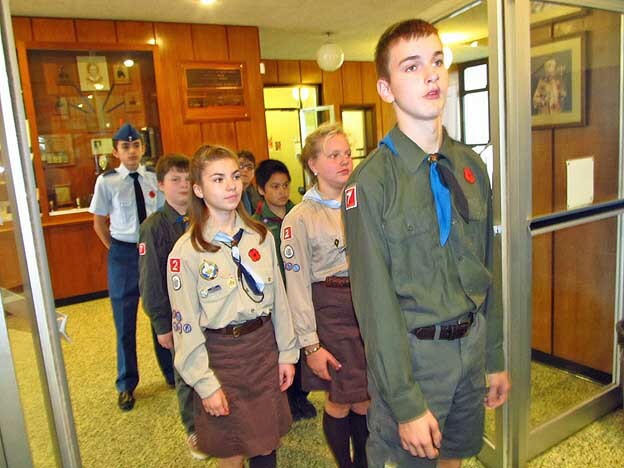 According to the Vetern Affairs Canada website, the Royal Canadian Legion suggests that the Poppy be worn on the left lapel of a garment or as close to the heart as possible. One of the highlights of the Remembrance Day service is the traditional laying of the wreath by the school’s “Colour Party”. 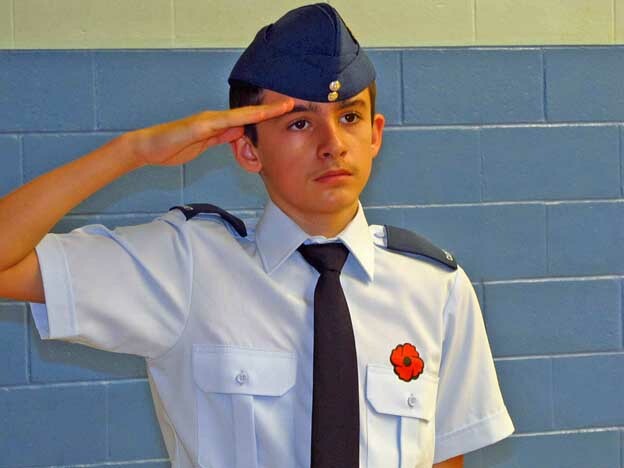 The Colour Party is always composed of a group of grade 7 and 8 students who belong to a “uniform” wearing organization such as Sum, Plast, or the Royal Canadian Air Cadets. 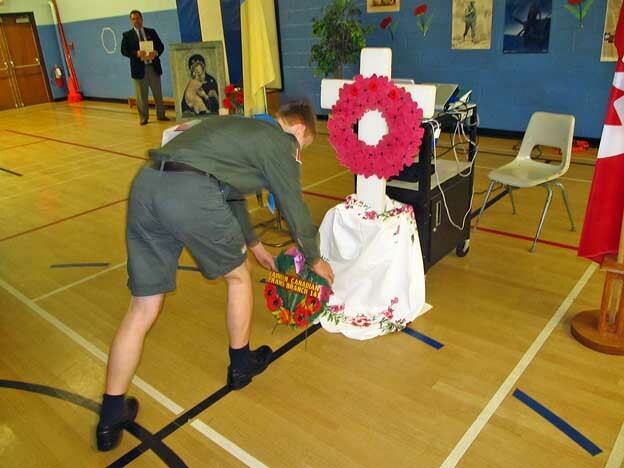 This year’s Colour Party was made up of Jordan S., Serhiy S., Arsen Y., Arianna B., Nina H., Mark D., and Yaroslav P.
The Colour Party marched loudly and in perfect formation from the gym entrance, along the back wall, and down the middle of the gym to the symbolic cenotaph at the front. Yaroslav P. laid the wreath on the cenotaph and then stepped back and saluted while the rest of the marchers filed around on either side of the cross. The marchers assumed their positions and saluted during a recorded bugle call entitled “Last Post”. The Last Post is a bugle call that has been incorporated into military funerals where it is played as a final farewell, symbolising the fact that the duty of the dead soldier is over and that they can rest in peace. Everyone remained silent and solemn while the Colour Party held their salute during the moment of silence. 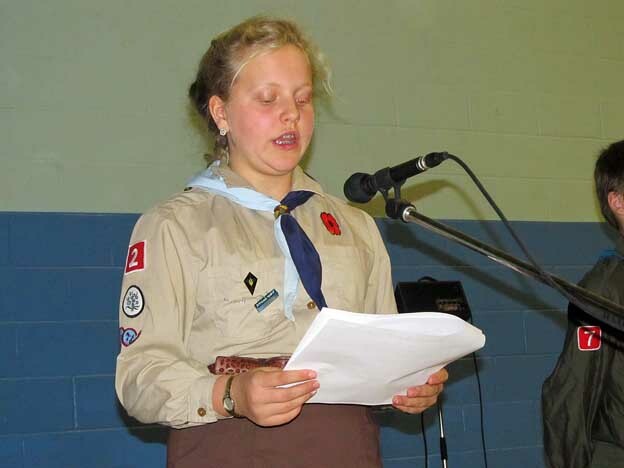 After the moment of silence, Student Council President Nina H. read a “Peacemaker’s Prayer”, followed by the prayer “Our Father” recited in Ukrainian. 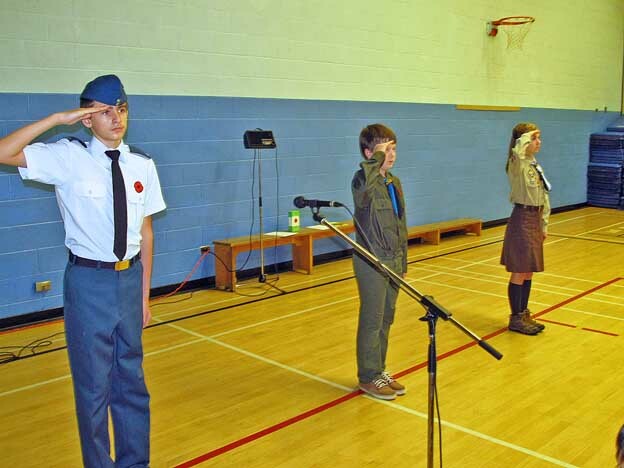 At this point, the Remembrance Day Service was over and students filed out of the gym and back to their classrooms. War is a terrible thing – it’s the deliberate killing of other human beings. Nobody wants war, but it still happens all the time. Human nature suggests it’s probably impossible to completely eliminated all wars on Earth, but at least we can hope for it to occur less often.